You know we are winning? We don’t look up for this so far. Big improvement required. Nah it’s alright apparently we are playing like the Brazil 1970 team atm and none of us apart from one person can see it. Candeias off and Grezda on for the second half. Why is Kent so stupid to get booked for celebrating ? That could end up costing us. He's scored at Hamilton not won the world cup. We haven't really done much and lucky to be in front but it was great play for the goal. They have probably had the best chances but thankfully poor finishing. Didn't see much of coulibally in that half and candias needs to be careful about a second yellow. Hopefully an early goal in the second half and we push on. 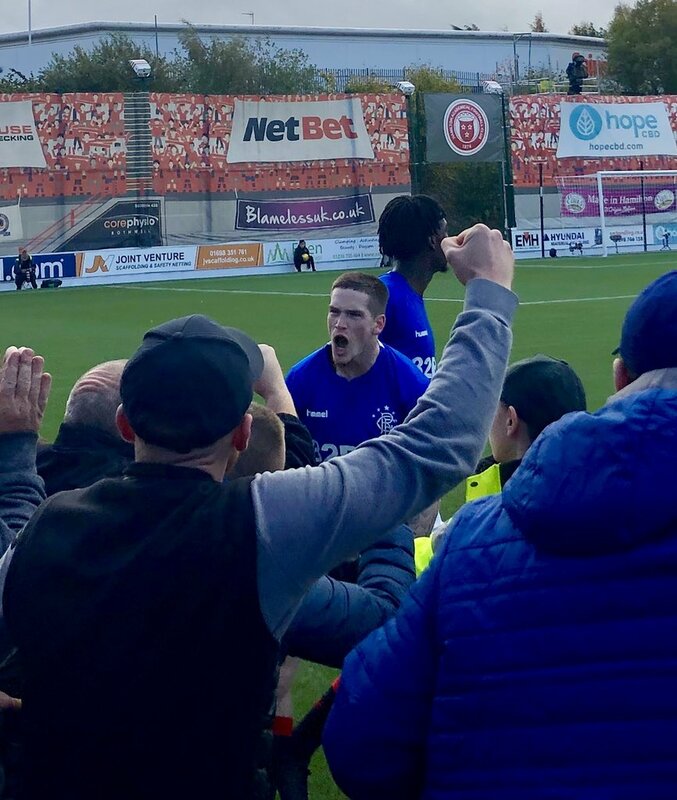 Do hamilton have any plans to build another stand , it's a joke of a stadium , surely cant cost that much to put something at least behind the goal , bigger clubs would fill 2 stands no bother they would of made their money back years ago tinpot FC..
Katic looks all over the place. Poor lad looks broken. Wasn't a good idea dropping him for Worrall,looks like it's zapped his confidence. I could understand if a young chick wrote this, the point is valid, the pet name is dreadful. I don’t think we’re out the woods until we get that second. I doubt think John Brown ever won a cap did he? He'd be Scotland's star player now. Plastic pitches aim to give poorer teams an advantage. Simple as that. It was the same against Livingston. I can't blame the players for thinking they have to be more careful on these pitches, but it slows our game down compared to how we play at Ibrox. Immense that we scored. Great touch by Morelos and a brilliant finish by Kent. Willie Miller is a %^*&'ing wankstain. I hate the c'unt more now than I did when he was a player. Is that related to this match or you just fancied saying it? I mean, I don't mind, just wondering! I'll be a happy man if we're 1-0 up at half time in every away game from now on in, regardless of how we play. Coulibaly is playing about 30 yards further forward than Rossiter. They are in no way similar. Coulibaly’s game is about energy and drive while Rossiter is about reading the game, interceptions and keeping the ball moving quickly. Yup. In fact coulibaly and ejaria could do with getting a bit closer to rossiter to help us control the ball in midfield. I know we go on and on about these pitches but they clearly put the shits up our players in terms of not getting injured. Ban the feckin things! Reminds me of playing in the playground at school on one of those frosty winter days, lethal! Maybe being dropped for feck all and not playing a competitive game in about a month has had some effect on Katic? Both confidence and sharpeness. He wasn't dropped for no reason he was injured. More energy and forward intentions from the midfield in this half please. We've been too slow with the ball and almost too scared to run at them as well. Been a really scrappy game. Thankfully we have a goal, however I'd take Candias off this half as a precaution for the booking. Pedestrian , no tempo and too many safe passes. Excellent goal aside, we have not been very good . I know we should never make excuses but playing on that surface hasn't helped , get them to %^*& out of the top league. Do Celtic players not worry about these pitches ? Hearts ? Hibs ? I agree, we seem to have a blockage on plastic.The pitch is same length as Ibrox,3 yards narrower. Ah, players do it every week without being booked. I was thinking about it first. Switch Kent to the right and Middleton left. Yep an absolute disgrace a player celebrating a goal with the fans ya mentalist. C'mon Rangers, we need a goal early here. Hamilton have a goal in them. Being dropped for f uck all would play a part in that.He hadn’t put a foot wrong until then. I believe they are upgrading to a more realistic drawing of a stand. Away and boil yer napper ffs. Tav is usually the best crosser of a ball in the team. But not today so far. Morelos gets through a ton of work for us. 2 Artificial pitches no matter how advanced technology the pitch has have no place in professional football.